First there was MC Escher, then came MC Donalds (better known as Mickey D’s), followed by MC Hammer. Now, MC Maguire takes his rightful place upon the world (sound) stage. Like his previous album, Trash of Civilizations, Nothing Left to Destroy sprinkles a gleeful pee all over the world of genteel music-making as it pits a solo instrumentalist against a barrage of sound samples. Brandishing an ancient Chinese melody played on violin and four disco beats as its primary source material, “The Discofication of the Mongols” chronicles the progress of Western popular music as it steamrolls over traditional music around the globe. Rest assured, you can’t dance to this sonic onslaught–unless you’re in the midst of a grand mal seizure. “S’Wonderful” replaces the violin with a flute and really packs a stuttered punch! Combining the process of the medieval quodibet (the inclusion of popular melodies into a larger piece) and the current musical trend of mash-ups, this chaotic quilt digs up, transmogrifies and layers such sounds as MGM musicals, gangster movies, big bands and a seemingly endless amount more. Maguire’s music may sound cacophonous, but it is actually carefully composed. Fans of the INA-GRM label will love this stuff, and it would be fun to sneak this CD into the punk bin, what with its punk rock-looking album cover. 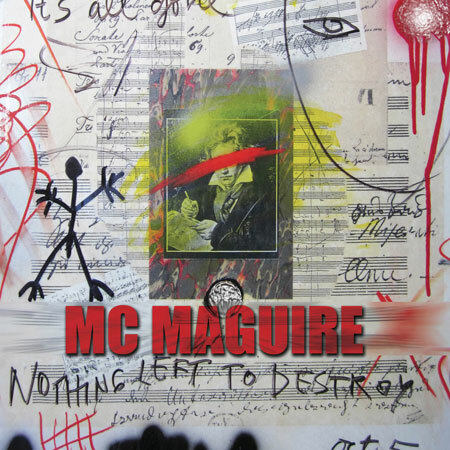 If there really is nothing left to destroy, I wonder what MC Maguire’s next album will sound like? You are currently browsing the Arcane Candy weblog archives for March, 2012.